“The Old Brown Place” — as some members of the family — remember where Jess and Millie were living at the time of Jess’s death (October 1957) is actually located in the southwest corner of Logan County, Arkansas. I thought I would try to help my Cartwright cousins who never actually saw where Jess and Millie lived in the 1950s to bring this location in focus but using the Family Maps information. It has proven a bit trickier than I thought it would be. Here is why. 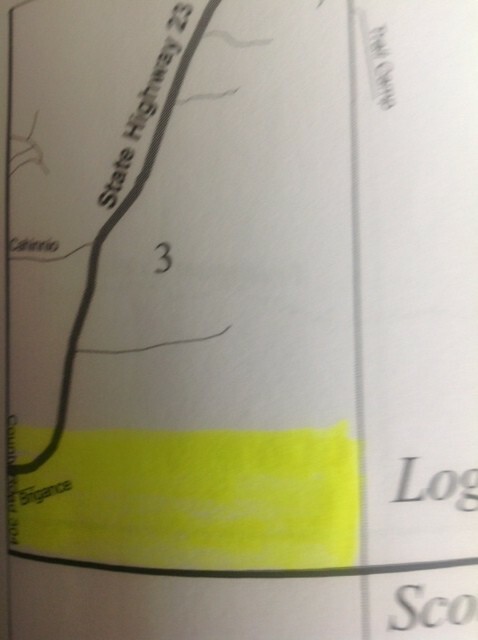 When family members have tried to explain where the home place is located, they typically refer to the big curve in the road on Hwy 23 about a mile east of the intersection of Hwy 71 and Hwy 23. Others locate it in relation to the old Boy Scout Camp near the little community of Tate, which is located a bit further east (also in Logan County). While “The Old Brown Place” may be the way local folks referred to this property in the mid-20th century, that location appears to have been homesteaded by a man named Samuel Fellner in 1888. See maps below from pp. 282-283 of the Logan County Family Maps volume, Township 4, North Range 29, West (5th PM) in Section 3. 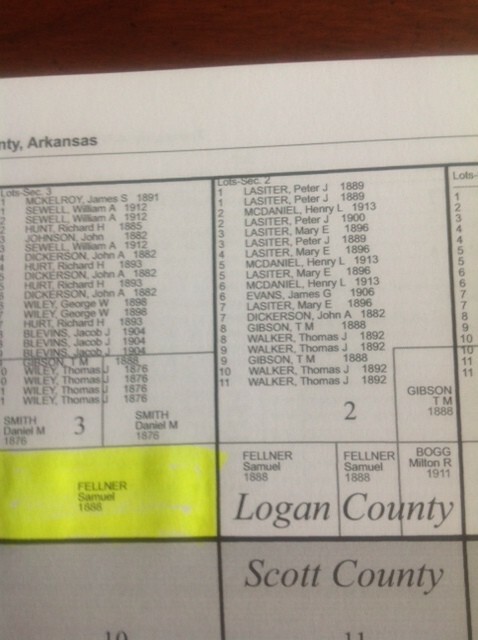 I have not taken the time to trace the connection to see if the Brown family who homesteaded property almost two decades later further east in Logan County could be the folks who later lived on the Fellner homestead, but given the geography there may be some connection. 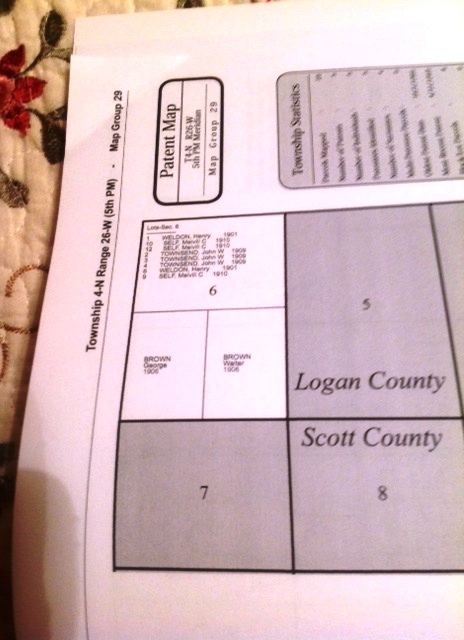 See page 299 of the Family Maps of Logan County, Arkansas, Township 4, North Range 26, West (5th PM) in Section 6. The Brothers Brown — George and Walter — bought the land along Jack Creek in 1906 (see Family Maps diagram below). Presumably the house where Jess and Millie lived was built sometime in the early years of the 20th century, because it was described as fairly old at the time they lived there. There is no house on the Brown place today, and I don’t think there has been since the 1970s. So, the best we can do is to watch for the County Line marker on Hwy 23 and remember that the Old Brown Place was located just east of the Scott County/Logan County Line. I found it interesting to discover that there is a broader sense in which this area of Arkansas has been contested in local memory. The first name of the county was “Sarber” — a man who was regarded by most Arkansans as a “carpetbagger” — but as soon as the leaders of Arkansas were able to escape from the clutches of Reconstruction they chose to rename the area for James Logan, a leader that the people of Western Arkansas felt better about commemorating. The border lines of Scott County was changed in a couple of ways over the years in relation to the two counties to its North (Sebastian, where Mansfield is located) and Logan (where Booneville is located). Whether Jess and Millie enjoyed any particular advantage from having lived just over the county line, I do not presume to know. Elsewhere in the state of Arkansas (Moiuntain View in Stone County for example), bootleggers were known to take advantage of the local option laws that made it legal to have beer in one county, but not in the next one. Although Jess is known to have supplemented his income at times (during the Depression) by making moonshine (or so he told my mother Mary Frances Cartwright Wilson in 1956-57), we do not have any knowledge of him having been in conflict with local law enforcement officials over the matter. So while the original “home place” for the Cartwright clan was in Scott County, the places that my father Billy Cartwright and his siblings associated with “home” were in that area where the three counties came together. Less than seven miles separates the historical communities of Tate, Bloodsworth, Ione, Boothe, Abbott, Square Rock, Lucas, Elm Park, Freedom, and Packsaddle, but you have to really do some map manipulation to get them all in focus at the same time because of the way they are mapped in time and space. This entry was posted in from East to West, Questions of the Week and tagged Abbott, Bloodsworth, Booth, county lines, Hwy 23, Hwy 71, Ione, James Logan, Logan County, Petit Jean River, Sarber County, Scott County, Sebastian County, Tate. Bookmark the permalink. Thanks for your comment, Aunt Betty!